Amy has been walking for around 3.5-4 months now, so this post is long overdue. However, I can say that we have really put the shoes, that the lovely people from Bobux sent us, to the test. Amy was taking her first proper steps in them. She chased squirrels in St James Park. Ran a marathon in my parents’ living room and sometimes, she even used them as a teething toy. 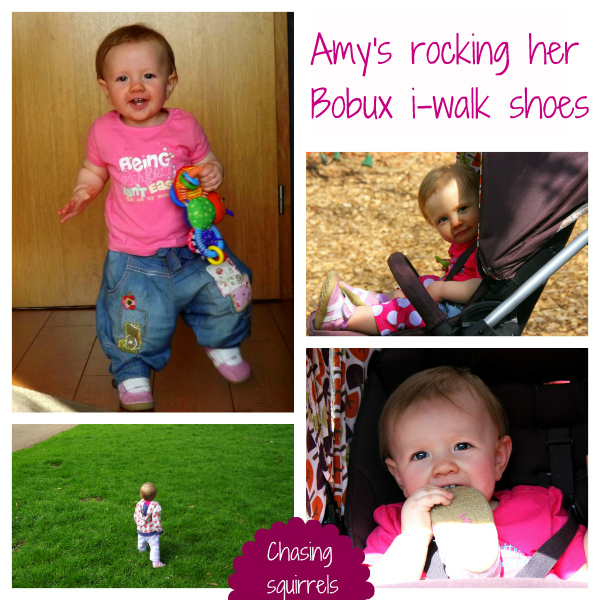 The shoes we’ve been sent are from Bobux’ ‘i-walk’ range and are designed specifically for confident, little walkers. They’ve got a secure fit around the ankle and heel, with lots of wriggle and growth room at the front of the shoe. We picked the i-petal sports shoes and I have to say that I am very impressed with their overall quality. They came in a sturdy little box and are made from soft leather that comfortably hugs Amy’s little feet. The velcro fastener allows you to adjust the width of the shoe and makes sure that the shoe securely sits on your toddler’s foot – well, at least if you don’t have a sister like mine who couldn’t wait to teach Amy to take them off! As Amy is a little whirlwind, I find it really important that her shoes have anti-slip soles. She is running around so quickly that knowing that her shoes have a good grip, just gives me some extra piece of mind, especially if she is walking on laminate flooring or tiles. Amy’s i-petal trainers are made from soft pink and white eco-leather that is fully breathable and therefore making sure that her little feet are ventilated and not over-heating. All in all, Bobux’s ‘i-walk shoes’ are great footwear for active toddlers. They are well-made and designed and look really trendy on my little girl. However, the most important thing is that they are healthy for the development of Amy’s little feet and that she loves them as much as I do. What could you want more from a shoe? Disclosure: We were provided with a free pair of Bobux ‘i-walk shoes’ for the purpose of this review. All opinions are my own and have not been influenced in any way.